In our Journey through the book of Acts we have seen that the Disciples Paul and Barnabas stayed in Antioch for three years, encouraging, teaching and establishing the church. Their faith and commitment is a great encouragement to me and I am sure to every missionary that followed them. 1 Certain people came down from Judea to Antioch and were teaching the believers: “Unless you are circumcised, according to the custom taught by Moses, you cannot be saved.” 2 This brought Paul and Barnabas into sharp dispute and debate with them. So Paul and Barnabas were appointed, along with some other believers, to go up to Jerusalem to see the apostles and elders about this question. The apostle Paul was not impressed, he had strived all his life, prior to his conversion to the Christian faith to fulfil all the requirement of the Law- God had shown him that he couldn’t, even though the OT Law was good, all it could do was to point to something greater and better, a new covenant one of Grace, love and freedom. This is seen in the wonderful Gospel of the Lord Jesus. The author of Hebrews puts it this way. Paul’s argument in Romans 5 makes this clear. 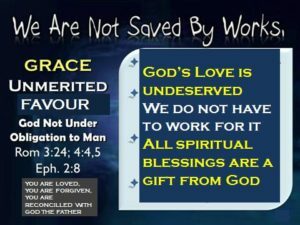 This is God’s work; this is GRACE for we are not saved by works but by Grace. 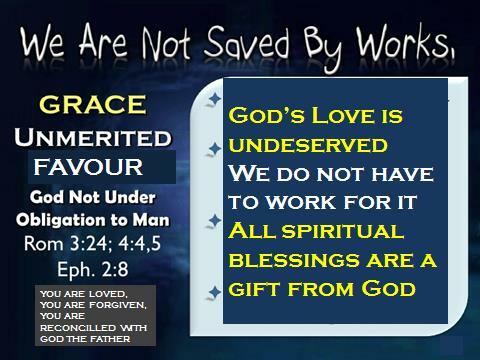 We are not saved by works; Grace is God’s unmerited favour: For God is not under any obligation t man. The very thing that separates man from God is dealt with through the Lord Jesus- this is God the Father’s grace in action. This is why Grace is so important; this is why the Apostle went to the church in Jerusalem. This is why we are here today. FAITHFULNESSS – Faithful to God’s Call, trusting in the Lord Jesus no matter what. OBEDIENCE – Submitting to God’s will- taking the Lord Jesus’s words to heart and acting on them. These qualities or attributes of the Christian life were the wonderful result of the relationship with the Lord Jesus and the impact of the indwelling of the Holy Spirit. Perseverance is like that- every journey begins with a single step- not always the easiest of steps. Their obedience once again brought them into strife; It is the second time that they are before the Sanhedrin. The council was angry; they wanted to put the Apostles to death. It is all about The Lord Jesus. For the early church, the Disciples and the Apostles it was all about HIM. Luke wanted the world to know the power behind the church and the process whereby the early church made various life changing decisions. The world was at a crossroads, the Roman Empire was at a crossroads, the nation of Israel was at a crossroads. I believe that 21st Century man is at a crossroads! This nation is at a crossroads, politically, morally and ethically. We too as a church must face a number of important issues as we consider the future. As we do so I would like us to be influenced in our decision making processes by taking a leaf out of the New Testament Church’s history. I believe that when the church moves away from Biblical truths and principles it loses its direction and reason for being. To know God’s will is a beautiful thing. There is so much that we know from the Word of God that gives us direction to know God’s will in our lives. I understand that sometimes the specifics are hard to grasp, but there is no excuse for ignorance of God’s general will for our lives. There are some questions that we ask God that need not to be asked. How many times in ministry have I been asked general questions about life style and conduct, forgiveness and care; as if the answer was difficult to find. The Word of God is plain and clear about these things. As we saw early in the piece the church had to deal with dishonesty, people pretending to be what they were not, we also saw how God dealt with this. In Acts 6 we will see another situation where there are murmurings, destructive murmurings that if left unchecked could bring the house down. We will see how the Apostles and the early church dealt with these murmurings. If you want to destabilise a situation start rumours, sow seeds of doubt, give people a sense of insecurity, and the job is half done!